The Council of Bishops of the Ukrainian Orthodox Church of the USA, members of the Metropolitan Council and Consistory, as well as clergy and faithful of the Ukrainian Orthodox Church of the USA offer sincere gratitude to the hierachs, clergy, faithful of various religious and community organizations for their words of sympathy and prayerful support, as the Church commemorates in her prayers the spiritual father and Primate of the UOC of the USA - Metropolitan Constantine of blessed memory! Christ is Risen! Christos Voskres! Christos Anesti! As the Exarch of the Ecumenical Patriarchate, and on behalf of the Holy Eparchial Synod and the Clergy and Lay Faithful of the Greek Orthodox Archdiocese of America, I am offering our profound condolences on the falling asleep in the Lord of the most blessed First Hierarch of the Ukrainian Orthodox Church of the USA, the deeply beloved and respected late Metropolitan Constantine. The passing of the Metropolitan is a deeply felt wound not only for the pious Ukrainian People, but for all Orthodox Christians who have admired his saintly and wise pastoral stewardship of the Ukrainian Orthodox Church. His lifetime of exceptional leadership will live on in the hearts and minds of all Orthodox who were privileged to know his ministry. Your Eminence, Your Grace, and dearly beloved and respected brothers and sisters in the Lord, as you reflect on this inestimable loss, and prepare to bid farewell to your beloved Hierarch, as well as face the extraordinary task of establishing his successor, please be assured of our prayers for you and all the pious Ukrainian Orthodox People. May your sorrow be tempered with the comfort and hope that is in the Resurrection of our Lord Jesus Christ: Christ is risen from the dead, by death trampling down upon death, and to those in the tombs He has granted life. As we, and all the members of the Assembly of Canonical Orthodox Bishops of North and Central America, remember you in this time of grief and mourning, we shall also offer our fervent supplications to God for His great servant Metropolitan Constantine, that he may find the reward of "the faithful and wise steward" that he most surely was, having fought the good fight for the forty years of his arch pastoral ministry, and that he may rest in the blessed hope of the Resurrection of our Lord Jesus Christ. May the memory of Metropolitan Constantine, this exceptional leader of the Church, be eternal. It is with great sadness that we learned of the passing into eternal life of His Eminence, Metropolitan CONSTANTINE just two days after celebrating his 40 anniversary in the holy and sacred episcopacy. Please know that the his loss is not only felt among the clergy and faithful of your God-protected archdiocese, but throughout Orthodox America. Having worked with Metropolitan CONSTANTINE in both SCOBA and the Assembly of Bishops over many years, I knew him to be a faithful servant in the vineyard of the Lord. On behalf of our local synod of bishops, and the clergy and faithful of our Antiochian Orthodox Church of the USA. Be assured that we will remember him in our prayers for the next 40 days. On behalf of His Eminence Metropolitan Yurij, the Council of Bishops, the Office of the Consistory, the Consistory Board, clergy and the faithful of the entire Ukrainian Orthodox Church of Canada, we express our deepest sympathies to the Hierarchs, clergy and faithful of the Ukrainian Orthodox Church of the U.S.A. as well our sincere condolences to Metropolitan Constantine’s family members. With the Blessing of His Eminence, Metropolitan Yurij, our clergy and faithful are asked to remember the newly reposed Metropolitan Constantine in your prayers and liturgical commemorations. O Lord, give rest to the soul of your departed servant Metropolitan Constantine, in a place of light, a place of refreshment and a place of repose, where there is no sickness, sighing nor sorrow. Вічная Пам'ять! Memory Eternal! Вічная Пам'ять! З великим сумом, Єпархії Митрополії УАПЦ в діяспорі сприйняли сумну вістку про передчасну кончину трудотливого Христового воїна Блаженного Митропо-лита Константина Української Православної Церкви – США й УАПЦ в Діяспорі. В імені Духовенства і вірних Єпархій, Велико-Британської, і Західної Европи та Австралійсько Новозеляндської Української Автокефальної Правослвіної Церкви в Діяспорі, складаю наше глибоке співчуття родині, Архипастирям, Консисторії й Духовенству та вірним УПЦ США. Молю Господа, Бога, щоб подав родині сил і витривалости перенести душевні болі, а трудотливого слугу Христового виноградника балаженної пам’яти Константина, оселив де всі праведні спочивають, а блаженна пам’ять його буде вічна. On this Ascension Day, and on the eve of Metropolitan Constantine’s funeral, please receive these personal words of condolence and spiritual eternal memories upon the sad and unexpected repose in the Lord of our beloved Metropolitan Constantine. A week ago, two European delegations - Mitred V.R.Vitalij Derewianka, with sons Pavlo, Ivan and grandson Ilia from the Metropolitan's Stavropegic Sobor in Genk, Belgium and I from the UAOC diocese in Great Britain set off to the Metropolitan’s home of Pittsburgh to accept the kind invitation to the 40th anniversary of the Metropolitan's Episcopacy. Having returned home ourselves, we reflect in prayer upon this journey of joy and sadness, now seeing and believing that we were called to and entered a road that needed to be traveled even by the Metropolitan Himself, believing that the " Greater the Light - the Greater the Shadow ". We crossed "the pond" into these Heavenly steps and the Road to be travelled. We packed and brought with us our simple gifts of love for our spiritual Father Metropolitan Constantine. Recognizing the special and high monastic name chosen by the Metropolitan which was also referred to by the Ecumenical Patriarch in His greeting, we thought upon the need of special gifts for our Metropolitan and through a vision an Icon from Mount Athos of the Great Emperor Constantine was commissioned. At Friday's Thanksgiving Service, and from Kyiv, was gifted a Guardian Angel triptych whilst a golden icon-pair of the Christ the Saviour and the Mother of God was also gifted at the end of the Jubilee dinner, during which the Icon of Constantine was presented whilst the V.R.Fr. Vitalij presented amongst his many gifts, an ancient Orthodox Cross. On Friday mid-day a large restless bird was seen outside in the roof window corner of Room 410 at the Clarion Hotel, which flew away speedily to the ground, flew back to the window making much noise, then quietly flew away quietly, – a sign from Ukrainian folk-lore that announces and calls Souls and the Spirit away from this world? On Sunday we had the personal pleasure to visit the Metropolitan at the house of His niece where the Metropolitan was in high spirits, and called us to Him, where at His feet and on our knees we heard the Metropolitan’s visions of the future, during which we thanked Him for His blessings, recent elevation and Spiritual care, not knowing that we were hearing His last Testament. Then, again not knowing or believing that our calling would be the final farewell, we departed asking the Metropolitan for blessing and prayers and to hear His final earthly words to me, " Pray for Me Father Bohdan", as the Metropolitan full of Life and Happiness left to return to His Home, - to repose in the Lord on Monday morning 21st May, which by the Julian Calendar is the Holy name day of the Holy Equals-to-the-Apostles Emperor Constantine (337) and Helena, his mother (327). So the feet that traveled the Orthodox world have now stopped walking, the lips that proclaimed Faith, Hope and Charity and true love of God are now sealed, the eyes that saw goodness in everyone have closed, and the heart that loved His parents His family, His Bishops, loved Us and all his flock, has stopped beating. Rest in peace our eternal Ukrainian Orthodox Emperor Metropolitan Constantine. Your Beatitude, carry under your resting Miter and to the Lord the names of those whom You consecrated and ordained here upon earth. May your Guardian and All the Angels carry Your Soul Upon High to Almighty God Himself, as we eternally pray for the peace and repose of the Soul of our Metropolitan, and thank Almighty God for the Life of Metropolitan Constantine, the One who touched and guided us All. It is with deep sadness that we have heard about the falling asleep in the Lord of His Eminence Metropolitan Constantine of Irinoupolis, First Hierarch of the Ukrainian Orthodox Church of the USA. We were aware of his illness and struggle. The Almighty God called His servant Metropolitan Constantine to eternal repose in the kingdom of heaven just 2 days after his 40th anniversary of Archpastoral Ministry. Many of our Romanian people have met His Eminence Metropolitan Constantine and appreciate his kindness, fatherly love for the priests and laymen, pastoral care for every person in need. As a member of the Assembly of Bishops and brother concelebrant of the Holy Mysteries, I have always valued his wisdom and leadership. We share with all the priests and faithful of the Ukrainian Orthodox Church of the USA the feelings of regret and sorrow. On behalf of the priests and faithful of our Archdiocese, please accept our sincere condolences. We pray our Risen Lord Jesus Christ to establish his soul where the righteous repose. We assure you of our prayers for the soul of His departed servant Metropolitan Constantine. Father in Christ, His Eminence, Metropolitan Constantine in the mansions of Heaven. The entire Church is grateful for the leadership of His Eminence for forty years. This Diocese is particularly grateful for the friendship of His Eminence with our late bishop, + Metropolitan Nicholas. our prayers as we offer them up at the altars of our diocesan churches. To His Eminence Archbishop Antony, His Grace Bishop Daniel, Reverend Clergy and the Faithful of the Ukrainian Orthodox Church of the U.S.A. I greet you with love in the Name of our Lord and Savior Jesus Christ., but with a heavy heart. I was so saddened to learn about the passing away of my dear friend and brother in Christ, His Eminence Metropolitan Constantine, and wanted to extend my deepest and most heartfelt sympathy to you on his falling asleep in the Lord. We honor his memory, as he faithfully served our Lord and His Holy Orthodox Church with unwavering commitment and Christ’s love in his heart. Truly your beloved spiritual father has left behind a wonderful legacy in the memories and the hearts of everyone who had the privilege of knowing him. The joy of our Lord’s Resurrection from the dead is the first consolation we have for the profound sadness felt as we have learned of the passing of our brother hierarch, Metropolitan Constantine of the Central Eparchy and Primate of the Ukrainian Orthodox Church in the USA. True to the meaning of his name, after the great Saint Constantine, equal to the Apostles, His Eminence certainly “stood firm” for so many years, “rightly dividing the word of truth” as a shepherd of the Lord’s sacred flock. Thus our consolation is that His Eminence now firmly stands as a constant intercessor for the faithful, having “passed from death to life” in the Resurrection of our Savior. While we feel the pain of loss of our brother in the Lord, we give thanks for his devoted archpastoral ministry, and we join our prayers to all those who pray that he abide with the saints, “shining as the stars of heaven,” even as His Eminence continues to pray for us. May those prayers result in comfort for immediate family and relatives, for friends and fellow servants, along with a renewed faith and hope, for Christ is risen from the dead! Please accept my heartfelt sympathy and brotherly love upon learning of the passing of our beloved brother and concelebrant, Metropolitan Constantine. He was a true servant of the Lord who devoted his entire life to bringing people closer to Christ and the Holy Orthodox Church. His special care and compassion for the youth was especially significant, as he strongly influenced their involvement in the church and was committed to strengthening their faith and belief in Jesus Christ. What a blessing it was for His Beatitude to celebrate the 40th Anniversary of his episcopal consecration just days before his passing. This was a time of joy and love for his clergy and faithful flock to honor his service to Christ and the Holy Orthodox Church and I am certain that His Beatitude was uplifted by their generous presence. It was a blessing to have known him and to have benefited from his wisdom, kindness and gentle spirit. May the Lord grant him eternal rest among the Saints, and may the love of Christ sustain his grieving flock. I was indeed very saddened to learn this morning of the repose of our highly esteemed and very beloved brother, Metropolitan Constantine. May he be granted Paradise. On behalf of myself and all the clergy, monastics and laity of the Diocese of Wichita and Mid-America, I convey to Metropolitan Constantine's family, to you and to all the Christ-loving clergy, monastics and laity of the Ukrainian Orthodox Church of the USA sentiments of most sincere sympathy. May his memory be eternal, and may you be granted long life. Christ is risen. We were genuinely sad to receive word of the repose of His Beatitude, Metropolitan CONSTANTINE, from this earthly life, while still in the shadow of the celebration of forty years of service in the holy episcopacy. His Beatitude will, I know, be missed by all of you and by all Orthodox Christians throughout our country. May his memory be eternal, and may you be granted long life. It is with deep sadness that I learned of the falling asleep in the Lord of His Beatitude, the ever-memorable Metropolitan CONSTANTINE, Primate of the Ukrainian Orthodox Church of the USA. I was aware of his illness and recent hospitalization, but it was so wonderful and comforting to know that you were able to honor him and tell him how much you loved him at the celebration this past weekend, commemorating his 40th Anniversary of Episcopal Consecration and his 45th Anniversary of Priestly Ordination, just before God called him to blessed repose in His heavenly kingdom. Every time I met His Beatitude, he always was smiling with joy. He always showed me kindness and generosity – in my many years as a priest and my few days as a bishop. In return for his tireless labors for the holy Church, I am confident that as He closed his eyes to this world, His Beatitude opened them to the One He served so faithfully, so lovingly and so joyfully for so many years and that he received this blessing: “Well done, good and faithful servant, you have been faithful over a few things, I will make you ruler over many things. Enter into the joy of your Lord” (Matthew 25:33). It is with sadness that we along with the Ukrainian Orthodox faithful in the Diaspora have learnt of the passing of His Beatitude Metropolitan Constantine. The ever memorable Metropolitan, served Christ's Church dilligently and in particularly is remembered with fondness by many of the God fearing faithful of the Diocese of Australia and New Zealand, as he was able to visit us here on the fifth continent on pastoral visitations, the faithful along with the clergy of our Church join you all in mourning the loss of a Hierarch who will be remembered by our faithful as an accesible, hard working Church man who loved his Church, his faithful and especially the youth. But with this sadness comes joy, joy in the realisation that we all; especially the Ukrainian Orthodox Church of the USA were able to have such a Hierarch who for so many years faithfully offered himself, his gifts, his time, his love. The Sacrificial life of the priesthood, the perfect High priesthood of Christ is evident in His servants when those who who are called to serve, serve giving all of themselves, The Metropolitan gave just this and we fervently pray during this period for his Blessed repose and that the words of St Paul to Timothy be relevent to his passing that «have fought the good fight, I have finished the race I have kept the faith. Now there is in store for me the crown of righteousness, which the Lord, the righteous Judge, will award to me on that day and not only to me, but also to all who have longed for his appearing.”(2 Tim 4,7-8). With the Blessing of His Eminence Archbishop Ioan of (Parnassou) I will be representing the Consistory of the UAOC Diocese of Australia and New Zealand at funeral services of the newly departed Servant of God Metropolitan Constantine this week in Pittsburgh, I ask your Blessing and add my voice to the choir of prayer for the Soul of our departed Metropolitan. Having learned of the blessed passing into His Kingdom of our brother in Christ Metropolitan Constantine of blessed memory, in behalf the clergy and faithful of the Holy Metropolis of Mexico, please accept our most profound sorrow and prayers for the repose of his soul. Metropolitan Constantine was a kind, gentle and humble servant of God who, while we did not have the opportunity of many meetings, nevertheless left a profound influence on my life, for his devotion and dedication to His Holy Church. He will be remembered in the proskomedia, in all of the Divine Services throughout our Holy Metropolis. May his memory be everlastingly eternal! With sadness I was informed for the passing of His Beatitude Constantine. I humbly pray that the Lord our God and Savior Jesus Christ will receive his soul and place it amongst the righteous in His kingdom. May his memory be eternal. Your Eminence Archbishop Anthony, Your Grace Vladyka Daniel, Bless! Just a short note to express my condolences on the repose of +Metropolitan Constantine. Though I have only known His Eminence for a few years, working for the ACOBA and as liaison to the Committee for Liturgy, it was always a special joy to speak and work with him. We connected immediately through stories of times gone by and his extensive experience as a true shepherd to his flock. He was always approachable and forthright, a true Pastor in the model and image of the Good Shepherd Himself, Christ, our Lord. Due to his declining health, the work of the Committee for Liturgy did not produce at the rate of other committees. However, the joy and love for the Church and the work of the ACOBA expressed and demonstrated by our beloved Metropolitan Constantine was not lacking for a single moment. Special comfort is to be found in the meaningful joy that his repose comes not only after the celebration of the 40th anniversary of his consecration to the episcopacy of the Holy Ukrainian Orthodox of the USA and the 45th anniversary of his priestly service to Christ’s flock, but as the first Chairman of the Committee for Liturgy, it also comes during these remaining days of our liturgical celebration of Pascha! Please accept my sincere condolences to all the beloved hierarchs, clergy and faithful of the Ukrainian Orthodox Church. Memory Eternal! З глибоким смутком сприйняли ми вістку про те, що 21 травня упокоївся в Бозі Предстоятель Української Православної Церкви в США і Української Автокефальної Православної Церкви в діаспорі, духовний глава Української Автокефальної Православної Церкви на рідних землях Блаженніший митрополит Константин. Ми, єпископи, зібрані на Постійному Синоді УГКЦ у м. Вроцлав (Польща), від імені усіх членів Синоду єпископів нашої Церкви, духовенства, монашества та вірних складаємо на Ваші руки, Високопреосвященний Владико, вирази нашого братерського співчуття та запевнення молитов за упокій душі блаженної пам’яті владики Константина. Нехай Всемилостивий Господь прийме до свого невечірнього світла Вашого Предстоятеля і співбрата у єпископському служінні, який був ревним пастирем для свого стада, невтомним будівничим Церкви Христової та вірним сином українського народу! Нехай винагородить йому вічним блаженством за усі його труди і жертви та скеровує до нього свою спасенну благовість: «Слуго добрий і вірний, в малому ти був мені вірним, поставлю тебе най великим. Увійди у радість Господа твого!» (Мт. 25, 21). On behalf of the United Ukrainian Orthodox Sisterhoods of the USA, we express our profound and sincere condolences on the passing of our beloved Beatitude Metropolitan Constantine. His Beatitude’s spiritual personality, loving ministry, and the strong love for our Orthodox faith and the Ukrainian Orthodox Church organizations infused us with love and spirituality in the Lord. Glory to Jesus Christ! Slava Isusu Christu! It is with great sadness that we have learned about the passing away of your beloved Metropolitan CONSTANTINE. So many members of our Carpatho-Russian Diocese share wonderful friendships with our Ukrainian brothers and sisters in Christ, and we wish to extend our condolences to all of you as you prepare for these tough days ahead of you, mourning the loss of your shepherd. Having lost our bishop, Metropolitan NICHOLAS just one year ago, we understand what you are going through. Losing a hierarch affects every member of the church in an individual and significant way. We still feel the loss of our bishop when we convene for diocesan events and do not see his familiar face. We still think of him during holy day Divine Liturgies and other special occasions, and miss him when we do not hear his familiar voice singing hymns. However, as time passes, nothing will take away the positive impact that your hierarch has had on your faithful. Clergy will remember him and carry on his good work. Laity will remember the lessons that he has taught. Most importantly, children will watch all of you as you mourn his passing, and see the impact on their elders of losing their shepherd. They will observe first-hand that losing a bishop is just the same as losing a member of the family, which will solidly demonstrate the importance of keeping the Church at the center of their lives! May this time of mourning impact your children in a positive way and teach them this important lesson! We are so happy that Metropolitan CONSTANTINE was able to celebrate his 40th Anniversary of Episcopal Consecration with all of you, just two days before his passing. We, too, were blessed to celebrate one last birthday party with our Metropolitan NICHOLAS weeks before his passing as well. We are thankful to God that you had this same opportunity – it will give all of you wonderful memories of your last time with your hierarch, and help carry you through the long road ahead. We encourage all of you to collect and share all of your photos and videos from this event, for all of the members of your diocese to have and treasure! May God grant eternal rest to his servant, Metropolitan CONSTANTINE. Eternal Memory! Vicnaja Pamjat! It is with great sadness, that I have learned of the falling asleep in the Lord of our Primate, His Beatitude, the Most Blessed Metropolitan Constantine. I have informed the faithful of the sad news, and I ask you to accept my sympathy and that of the faithful of The Wales Orthodox Mission, and to convey our sympathy to the family of His Beatitude and to assure them of our prayers. The Wales Orthodox Mission and I personally owe a great debt of gratitude to His Beatitude, Metropolitan Constantine. His Beatitude graciously and warmly received me and the Wales Orthodox Mission as an entity into his canonical jurisdiction almost ten years ago. Upon my first meeting His Beatitude at his home in Pittsburgh, I realised at once that he was a man of great humility, warmth and kindness. He was unpretentious in manner, and upon my handing him one or two small gifts, such as a framed icon of St David, Patron Saint of Wales, he was clearly very moved, and said most endearingly that it was not necessary to give him a gift. His Beatitude, Metropolitan Constantine was above all a man of deep devotion, as I saw more and more clearly, and it was a tremendous honour and blessing to be able to concelebrate the Divine Liturgy with him. I was moved by his deep knowledge of the Hierarchical celebration of the Divine Liturgy. I cannot over-emphasise the magnitude of the blessing imparted to us as Orthodox Christians within The Wales Orthodox Mission by His Beatitude Metropolitan Constantine, of having as our canonical and spiritual home, the Ukrainian Orthodox Church of the Diaspora. Whilst thanking God for the life and witness and ministry of His Beatitude Metropolitan Constantine, we will be praying for the repose of his soul and will pray also for the Western Diocese of the U.S.A that is now ‘widowed’ by the falling asleep of its Hierarch, our devoted Primate. З великим сумом дізнався про відхід у Вічність нашого великого лідера і духовного отця, Митрополита Константина. Це наповнює жалем всіх духовних дітей Української Автокефальної Православної Церкви в Республіці Паргвай. Висловлюємо найщиріші співчуття його рідним і близьким та всій Українській Православній Церкві! Від імені Сестринства, Молодіжної Організації та всіх Вірних Української Автокефальної Православної Церкви в Республіці Паргвай. Dear Hierarchs, Reverend Fathers, Deacons and family of our beloved Metropolitan Constantine. Please accept our sincere and heartfelt sympathy on the departing to eternal life in the Lord of His Beatitude Metropolitan Constantine. For last fourteen years Metropolitan Constantine guided our new parish as a Spiritual Father. We will miss his gentle voice, genuine smile, kind eyes and mostly his prayers. May God grant rest in blessed repose to His servant Metropolitan Constantine and may his memory be eternal. Франція, 24-го травня 2012 р. Б.
З почуттям великого суму сприйняли ми вістку про смерть Первоієрарха нашої Української Православної Церкви, Блаженнішого Митрополита Константина. Смерть Блаженнішого Митрополита є болючою втратою для нашої Української Автокефальної Православної Церкви. Від імені наших вірних Бельгії та Франції з Духовенством просимо Вашого Високопреосвященства прийняти вислови нашого глибокого співчуття. Клонимо свої голови в глибокій покорі та смутку і молимося за упокій душі спочилого. Для родини покійного молимо і просимо у Господа, щоб послав їм душевного заспокоєння. Школа Українознавства при Церкві-пам'ятнику св. Андрія Первозванного висловлює щирі слова співчуття щодо відходу у вічність Його Блаженства, нашого Духовного Батька, Митрополита Константина. Молимося щоб Господь Бог наш оселив його душу там де усі святі спочивають. Повнота УАПЦ розділяє сум ієрархів духовенства вірних з приводу кончини Блаженнішого Митрополита Константина. Молимось нехай всемилостивий Господь упокоїть душу його з праведними. Співчуваю ієрархам, духовенству, та вірним з приводу смерті Блаженнішого Митрополита Константина. Нехай Господь упокоїть його душу. Клір і миряни Львівської, Рівненсько-Волинської і Таврійської єпархій Укаїнської Автокефальної Православної Церкви із сумом сприйняли звістку про те що упокоївся в Господі Блаженніший Константин митрополит Української Православної Цекрви в США. Його Блаженство митрополит Констатнтин все своє життя присвятив служінню українському народу і Українській Православній Церкві в діаспорі. Ми з глибокою вдячністю згадуємо про його діяльність у встановленні Української Автокефальної Православної Церкви у Світі. Він був взірцем архипастирського служіння. Впродовж свого служіння Владика Константин багато сил і енергії вклав до процесу об'єднання Українського Православ'я. Ми з вдячністю згадуємо Його провідну і активну участь під час роботи Помісного Собору 2000 р.
Заносимо наші скромні молитви до Господа за упокій душі вірного Слуги Божого Блаженнішого митрополита УПЦ в США Константина і маємо надію, що духовний зв'язок між УПЦ в США і УАПЦ після кончини Блаженнішого митрополита Константина не буде перерваний. Нехай Господь упокоїть його душу там де всі праведні спочивають. Вічна Йому Пам'ять! З любов’ю Во Христі! Всечесні Владики, отці, дорогі брати і сестри ! Прийміть найщиріші співчуття з приводу відходу в оселі Господа Владики Констянтина. Приносимо молитви до Всевишнього за спокій душі нашого Митрополита і розділяємо сумну новину разом із всіма православними українцями в діаспорі та Україні. Дорогі владики! Всечесні отці! Брати і сестри! Харківське крайове православне братство святого апостола Андрія Первозваного УАПЦ з глибоким сумом висловлює найщиріші співчуття у зв’язку з упокоєнням в Бозі Блаженнішого Митрополита Константина. Молимося з усіма вірними, щоб милосердний Господь упокоїв душу владики Константина там, де всі святі Його спочивають. The heartfelt sympathies of the hierarchs, clergy, religious and faithful of the Ukrainian Catholic Archeparchy of Philadelphia are offered to you, our brothers in Christ, Archbishop Antony, Bishop Daniel, and to the clergy, religious, and faithful of the Ukrainian Orthodox Church in the USA on the loss of our brother in Christ, Metropolitan Constantine of Blessed Memory. As Primate of the Ukrainian Orthodox Church of the USA, Metropolitan Constantine provided spiritual guidance and direction for all Ukrainians in the United States of America. Particularly admirable was his strong commitment to the development of strong ecumenical relationships with other Churches. Metropolitan Constantine worked tirelessly for the robust development of the Ukrainian Orthodox Church in all of the territories he served. His love for our beloved Ukraine and his sympathies for the suffering of its people were at the center of his pastoral concerns. His love for the younger generations and his encouragement of all to foster their spiritual growth and involvement in our Churches and society was exemplary. Metropolitan Constantine richly revealed his love for Jesus Christ in his lifelong ministry of faithful service. We share in the heartfelt gratitude to Almighty God for the giftedness of the fruitful ministry of Metropolitan Constantine of Blessed Memory. Be assured of our prayers for his soul that he may receive the blessed commendation of our Lord given to a faithful and fruitful servant of the Lord; that his soul may abide in the presence of Our Lord in his heavenly kingdom. May his memory be eternal! On behalf of the clergy, religious sisters and laity of the Ukrainian Catholic Archeparchy of Winnipeg I wish to extend to you and the faithful of your Church our prayerful condolences on the falling asleep of His Beatitude, Metropolitan Constantine, of blessed memory. Even though he struggled with health issues, his cheerful and friendly spirit will be missed by those whom he encountered. I was honoured to have met him through the fraternal encounters of the bishops of our Churches, and I appreciated his participation in these discussions. I pray that the process of prayer and discernment you will now undertake in choosing new episcopal leadership for your Church will be fruitful, ready to meet the challenges of today's ever increasing secularized world. 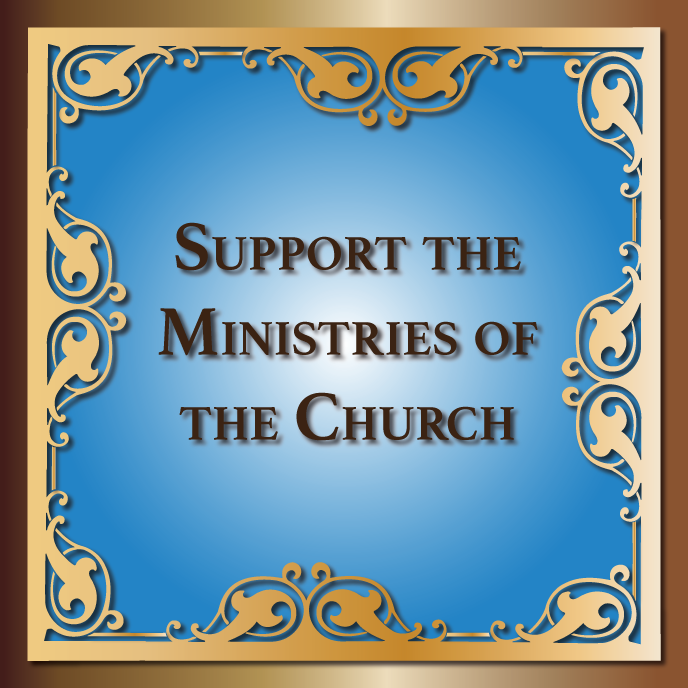 Please be assured of the prayers and support of the faithful of the Archeparchy of Winnipeg in the days that lie ahead. And may the memory of Metropolitan Constantine of blessed memory - be eternal in the Lord! Praise be to our Lord, Jesus Christ! Please accept, and convey to the Ukrainian OrthodoxChurch Community of the USA, the most heartfelt condolences of the ordinary, clergy, religious and faithful of the Eparchy of Stamford on the death of His Beatitude Metropolitan Constantine. May his memory be eternal! After many years of dedicated, exemplary compassion and service to the people of God, and after the gift of a verymemorable and heartfelt joyous celebration and commemoration of His Beatitude’s fortieth anniversary of Episcopal Consecration, our good Lord has called him home for his well deserved rest. We pray that our loving Father grant the Ukrainian Orthodox Church of the USA community much comfort during this time of change - when you celebrate His BeatitudeMetropolitan Constantine’s life, and mourn the void his passing into eternity has left. It is with deep sadness that I learned of the death of Metropolitan Constantine. I had been Rome at the time of his passing and would have liked to be at his funeral. He was a true friend of mine and I will miss him. Please know that he shall be remembered eternally by everyone who knew him. It is with profound sadness that I have received this news that our brother in the Lord, Metropolitan Constantine has fallen asleep in the Lord. I received this news in Ivano-Frankivsk where I am for meetings this week. I will celebrate a Divine Liturgy for the peaceful repose of the soul of the Servant of God the Arch-hierarch Constantine that his soul may be placed the place where the souls of the saints abide and that his memory be everlasting in the Lord. Christ Is Risen! Christ Is Truly Risen! Please accept my sympathy as well as that of the Roman Catholic Church of Pittsburgh upon the death of Metropolitan Constantine of Blessed Memory. Through the death and resurrection of Jesus, we know that we, like Him, have the gift of eternal life. Metropolitan Constantine now enjoys that gift. offer a Mass for Metropolitan Constantine as I remember them and you as well. 3 глибоким жалем ми прийняли вістку про упокоєння Блаженнішого Митрополита Константина. Покійний був молоденьким Епископом у Катедрі Святого Володимира тут у Чікаго, як наша громада Святих Володимира і Ольги творилася й знайшла гостинне приміщення у Вашій Катедрі. Разом з покійним отцем протопресвітером Федором Білецьким та щойно спочилим Олексою Пелюхівським, який в той час був Головою Парафіяльної Управи Катедри св. Володимира, покійний Владика був великим нашим приятелем і помічником. Ми разом служили різні свята і нагоди й все по приятельськи зустрічалися. Дозвольте, Високопреосвященніший Владико, висловити найщиріше співчуття цілій Вашій Церкві з нагоди цієї великої втрати. Рівночасно складаємо сердечну подяку за всю поміч, що ми їі одержали від покійного Митрополита та цілої Вашої Святої Церкви. We are saddened to learn of the falling asleep of His Eminence, Metropolitan Constantine, Ruling Hierarch of the Central Eparchy and Primate of the Ukrainian Orthodox Church of the United States in America, just one day after His Eminence celebrated 40 years of Archpastoral ministry. The fruit of his labors can be clearly seen in the strong and vibrant Church he leaves behind: in you yourselves, who are his letters of recommendation (II Cor. 3.1-3). We give thanks to Almighty God for the life of His Eminence, and for blessing the Orthodox Church with the example of his noble way of life. The clergy and faithful of the Northeast American Diocese of the Malankara Orthodox Syrian Church join Your Eminence and the faithful of the Ukrainian Orthodox Church of the United States in America in your grief. We assure you at this time of our spiritual closeness, remembering you, in our prayers. We also pray for the repose of the soul of His Eminence, Metropolitan Constantine, that, he may be granted to hear the Voice crying out to him: “Well done, good and faithful servant. You have been faithful over a little; I will set you over much. Enter into the joy of your Master” (Mt. 25.21). We are extremely saddened to hear of the repose of His Beatitude Metropolitan Constantine, the Ruling Hierarch of the Central Eparchy and the Primate of the Ukrainian Orthodox Church of the USA. Metropolitan Constantine’s zeal for Christ and dedicated years of service to the Holy Church is commendable. We rejoice in the fact that His Beatitude was able to celebrate the 40 anniversary of his consecration to the episcopacy and 45 year anniversary of his ordination to the priesthood. The fruit of his ministry is seen throughout America, and there is no doubt that his contribution to the growth of the Ukrainian Orthodox Church in America will be forever remembered, and his presence will be surely missed. On behalf of the Malankara (Indian) Orthodox Church, especially the Diocese of South-West America, we extend our heartfelt condolences to His Eminence’s family, to the Holy Synod, clergy, and all the faithful of the Ukrainian Orthodox Church of the USA. Though we are not able to attend the funeral services scheduled for this week due to a prior scheduled visit to Atlanta, we assure you of our prayers for the entire church community and most especially for the newly departed servant of our Lord. We thank the Lord for the life of His Eminence and pray that his memory be eternal. May God Almighty grant His Eminence a resting place along with the great Patriarch of Christendom. 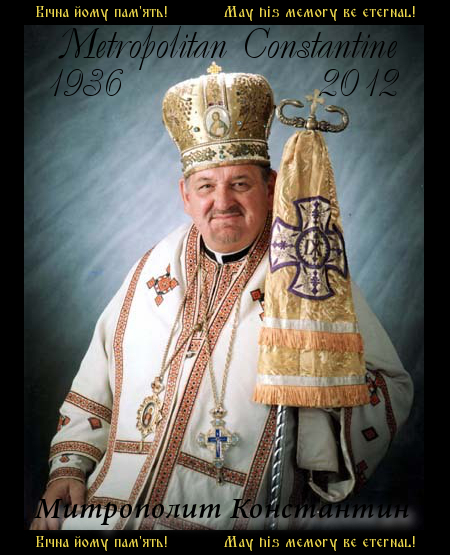 I am grieved to hear of the repose of His Eminence Metropolitan Constantine. I and the people of Epiphany Episcopal Church join you in praying for him. З глибоким сумом дізналися про перехід у світ вічності Предстоятеля Української Православної Церкви в США Митрополита Константина, у зв’язку з чим висловлюю свої щирі співчуття. Постать та внесок Його Блаженства у зміцнення Віри в Бога та консолідації українського духу в Сполучених Штатах важко переоцінити. Повертаюся спогадами до наших теплих бесід та зустрічей з Його Блаженством, після яких ставав більш духовно багатим і твердим у своїй Вірі. Нехай милість Всевишнього і Царство Боже стануть надійним прихистком Його душі. The Consulate General of Ukraine in New York has perceived with great sorrow news about the death of His Beatitude Metropolitan Constantine, Primate of the Ukrainian Orthodox Church of the USA, who passed away on May 21, 2012 – after 40 years of his Hierarchal service in the Lord’s vineyard. Metropolitan Constantine dedicated his entire life to the Orthodox Church and to the faithful. As true hierarch His Beatitude earned high respect among clergy and laity and his ecclesiastical service will be treasured for the ages to come. In this regard, the Consulate General of Ukraine in New York expressed its deep and sincere condolences to clergy and faithful of the Ukrainian Orthodox Church of the USA and to the family of late Metropolitan Constantine. З глибоким сумом висловлюю співчугтя Рідним та близьким з приводу відходу у Вічність Митрополита Константина! Смерть завжди є непоправною втратою, але особливо сумно, коли відходять такі особистості. В цей скорботний день висловлюю співчугтя і поділяю біль втрати Української Православної Церкви. Нехай Господь упокоїть душу його у Царстві Своєму. Вічна йому пам'ять! Please accept my sincere condolences on the falling asleep of His Beatitude, Metropolitan Constantine. The Kingdom of Heaven to him; may his memory be eternal. Vladyka Constantine was the first bishop I ever met. I remember how warmly we greeted him at the former SS. Volodymyr and Ol'ha Ukrainian Orthodox parish in St. Paul, MN, with the children greeting him with flowers. I vivdly recall a photo of Vladyka blessing my brother, Greg, who had just given him flowers. I also remember Vladyka being an excellent homilist. In the early 1990's, he came to celebrate the Temple Feast at the parish of St. George the Great Martyr in Minneapolis, where I was conducting the choir by the generosity of Kira Tsarehradsky. At the end of the liturgy, we sang the threefold Христос воскрес and at the end, Vladyka said quite loudly (to me): Коля, ще раз! His love for the liturgy was infectious. May God grant him peaceful rest, and comfort the sorrow of the faithful of the Ukrainian Orthodox Church. Світовий Конґрес Українців (СКУ) висловлює глибоку скорботу з приводу відходу у вічність 21 травня 2012 р. Блаженнішого Митрополита Константина, Предстоятеля Української Православної Церкви в США. Смерть Блаженнішого Митрополита Констинтина є болючою втратою для всієї української спільноти. СКУ пам’ятає покійного Митрополита як члена Ради директорів, який від 1993 року представляв інтереси Української Православної Церкви в США. СКУ вшановує Блаженнішого Митрополита Константина як видатного церковного діяча, який доклав багато зусиль до зміцнення Української Православної Церкви в США, надаючи при цьому великої уваги молоді та її ролі у майбутньому української церкви, а також до збереження та примноження духовних надбань нашого народу. It is with deep sadness that the U.S. Committee for Ukrainian Holodomor-Genocide Awareness 1932-33 offers its heartfelt condolences to the family and to the entire Ukrainian Orthodox community in your hour of despair at the passing of His Beatitude Metropolitan Constantine. His Beatitude’s devotion to God and country was evident in his messages to his flock and in his passion of service and duty to his Church and community. We will always remember his compassion on issues and his great ability to communicate his ideas effectively. The Holodomor-Genocide was a time that saw the land of our forefathers bound and enslaved by communist atrocities. As a Ukrainian organization dedicated to promoting Holodomor education within the United States, we mourn the loss of an ardent champion and supporter of remembering the horrors of the Holodomor in Ukraine. His Beatitude was stalwart in his resolve and became a beacon of hope that sustained our community’s endeavors to promote and advocate the dissemination of information to the American people about the Holodomor in Ukraine. We were grateful for his participation in the blessing of the land in Washington, DC which will serve as the location of the Holodomor Memorial and thankful for his fierce encouragement to his Church and community to not forget the lessons of the Holodomor! As we bear witness to the end of an era, the Ukrainian Orthodox Church and the Ukrainian American community have indeed lost a great leader. The U.S. Committee for Ukrainian Holodomor-Genocide Awareness 1932-33 wishes you strength in your darkest hours in the passing of His Beatitude Metropolitan Constantine. May his memory be eternal! We ask God to bless his family, the Ukrainian Orthodox Church, and the entire Ukrainian community, and that He protect and watch over us. З великим болем прийняли ми сумну вістку про відхід у Вічність Блаженнішого Митрополита Константина, Правлячого Ієрарха Центральної Єпархії та Предстоятеля Української Православної Церкви в США. В імені Крайової Управи Спілки Української Молоді в Америці та всього членства, висловлюємо наші найглибші співчуття Духовенству і вірним Української Православної Церкви в США, та зокрема родині Покійного Митрополита. Нехай буде вічна пам’ять Блаженішому Митрополитові Константинові! Честь України – Готов Боронити! Від імени Дирекції і працівників Українсько-Американської Федеральної Кредитової Спілки "Самопоміч" складаємо щирі співчуття з приводу смерти Блаженнішої Пам'яті Митрополита Константина, правлячого Ієрарха центральної Епархії та Предстоятеля Святої Української Православної Церкви у США. Митрополит Константин протягом довгих років був світлим провідником Церкви й Української Громади у Діяспорі. За час служіння Митрополита на позицїі Єпископа Західньої Епархїі з Катедральним осідком у Чікаґо, Блаженнішої Пам'яті Митрополит часто відвідував нашу Касу "Самопоміч" і був учасником різних громадських подій. Про Блаженнішої Пам'яті Митрополита Константи на залишилися приємні спогади у наших думках та на сторінках наших звітів. При нагоді ділимося з Вами деякими фотографіями з моментів дружньої співпраці під час щорічних зустрічей у Кредитівці, особливо на Різдвяних прийняттях духовенства. Нехай пам'ять про Блаженнішої Пам'яті Митрополита Константина буде вічна! За Дирекцію Кредитової Спілки "Самопоміч"
Богдан Ватраль Президент Кредитової Спілки "Самопоміч"
22 травня 2012 р. Б.
Зі сумом і скорботою Львівське крайове ставропігійне Братство святого апостола Андрія Первозваного УАПЦ довідалося про упокоєння Блаженнішого митрополита Константина Багана, Предстоятеля Української Православної Церкви у США та Української Автокефальної Православної Церкви у діаспорі. Очолення Блаженнішим владикою Константином IV Помісного Собору УАПЦ у вересні 2000 року і прийняття на себе обов'язків духовного опікуна над нашою Церквою в Україні вселяло надію на швидке вирішення проблеми розділення українського православ'я. Але зловорожі зовнішні чинники з Північного Сходу не дали можливості зреалізувати всі зусилля блаженної пам'яті митрополита Константи на, які були скеровані 'на поєднання всіх православних українців у єдиній помісні й Українській Православній Церкві. Ми щиро віримо, що новообраний наступник Митрополита Константина буде продовжувати справу спочилого у Бозі владики задля майбутнього «з'єднання всіх», як молимося у Літургій святого Івана Золотоустого. Українська Православна Церква в СШ.А. Складаємо глибокі співчуття з опорожнілим престолом митрополита Блаженнішим Константином, Глави і духовного Батька митрополії Української Православної Церкви в США. Близько півстоліття священнослужіння і сорок років відданої праці в єпископаті дали плоди доброго душпастиря у Церкві свого служіння. Щорічні зустрічі з єпископами братами Української Католицької Церкви дали нам приклад любови Господа у пошуках для кращого душпастирювання у любові ближнього. Святої пам'яті Блаженніший Константин повернувся в дім нашого Отця і каже нам словами псалмоспівця «жити мені в домі Господнім усі дні життя мого, щоби бачити красу Господню.» (Псалом 26/27). Долучуємося В молитвах за спокій душі боголюбивого Митрополита Блаженнішого Константина. Молимось, щоб добрий Господь потішив Вас та вірних обильними ласками пройти смуток втрати, бо «Господь силу Своїм людям дасть, Господь поблагословить людей своїх миром». Дорогі Владики, Отці, і Браття! Оцим прошу прийняти від мене глибоке співчуття з приводу упокоєння, В Бозі, блаженної пам'яті Митрополита Константина, мого близького товариша по школі. З Владикою Митрополитом ми познайомилися в 1953 році, коли він поступив на Богословський факультет Колегії Св. Андрея у Вінніпезі (Канада). У мене, по сьогоднішній день, вІД цього Спlлкування найкращі спогади. Вічна Йому Пам'ять, а Родині - глибоке співчуття! We wish to express our heartfelt condolences on the passing of our beloved Hierarch, Metropolitan Constantine of Blessed Memory, to his family, who loved him from the beginning, to the clergy who knew and loved him as children of his flock, and to all the faithful whom, as their primary spiritual father, he loved and nurtured. Truly our entire Christian Orthodox Communion worldwide was blessed by his leadership, as his ministry bore the Fruits of The Spirit during a lifetime dedicated to the furtherance of the Holy Gospel, and to the guardianship of our Apostolic Church. We are thankful to God as the beneficiaries of his ecclesiastical legacy, and now his spiritual achievements have become our own inheritance, offering a platform on which to build further, and a pathway to step forward, ollowing the example of a true forerunner sent by God. It is no small matter to contemplate, that throughout his 40 years of devotion o God and to His Church our Metropolitan Constantine presided over history-making events; and in so doing, through the wise efforts of God's Servant and our Hierarch, Christ's Holy Spirit was manifest and His Glory magnified. And these efforts are still witnessed in the lasting monuments to The Faith, and in the great foundational works that were accomplished in the Life of our Church. 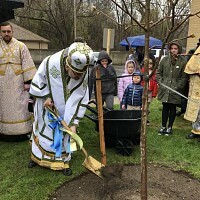 For our beloved Hierarch, Metropolitan Constantine of Blessed Memory, lived to edify us and bring us closer to Our Lord and Savior Jesus Christ, not only within the branch of our Ukrainian Orthodox House of The Christian Faith, but also within the global family tree of our Oecumenical Household of Orthodox Christianity, watering and adding to the Garden planted by Our Lord 2000 years ago, so that we should see God give the increase, and enjoy His abundant harvest in the future. As we are now in the period commemorating The Ascension of Our Lord Jesus Christ, we are assured by The Blessed Hope He promised to us; and therein we are steadfast in our belief that our beloved Hierarch, Metropolitan Constantine of Blessed Memory, is absent from the body yet present with The Lord; and there he continues in spirit to pray for us before The Throne of The Almighty, even as he did during his earthly sojourn. And so, in a place of light, in a place of refreshment and a in place of repose, he awaits us also, until our own departure, when we will join him in the heavenly mansions reserved for us by Our Lord and Savior Jesus Christ, in Life Eternal, with His Holy Angels and All His Saints. Вiчная пам'ять , AIWNIA H MNHMH, Eternal Be His Memory. Live Coverage of Funeral Services! Congratulation Letters to the New Primates of the Church of Antioch and the Church of Bulgaria!